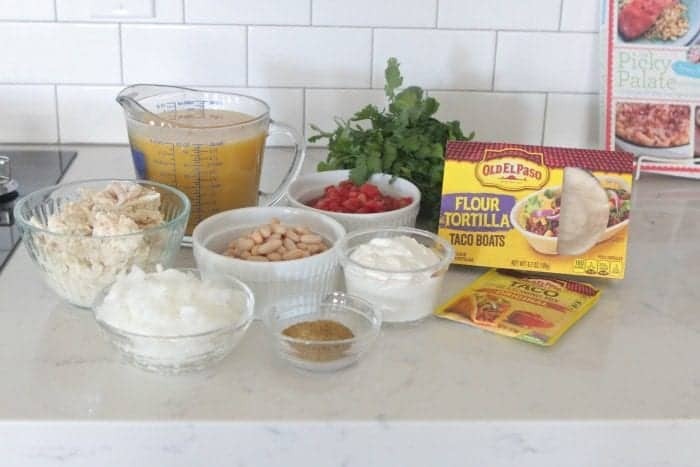 My Chicken Taco Soup Boats make the perfect quick fix weeknight dinner for the whole family! 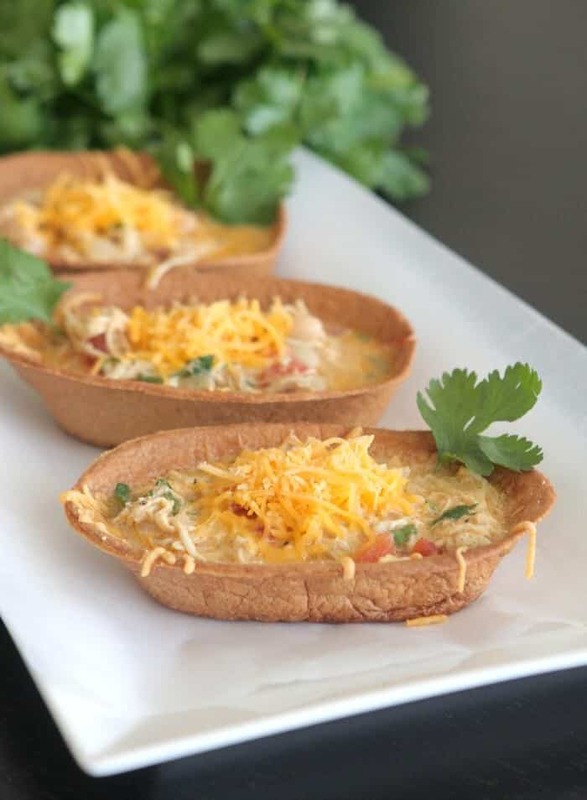 You are in for a fun and simple dinner idea with my Chicken Taco Soup Boats. 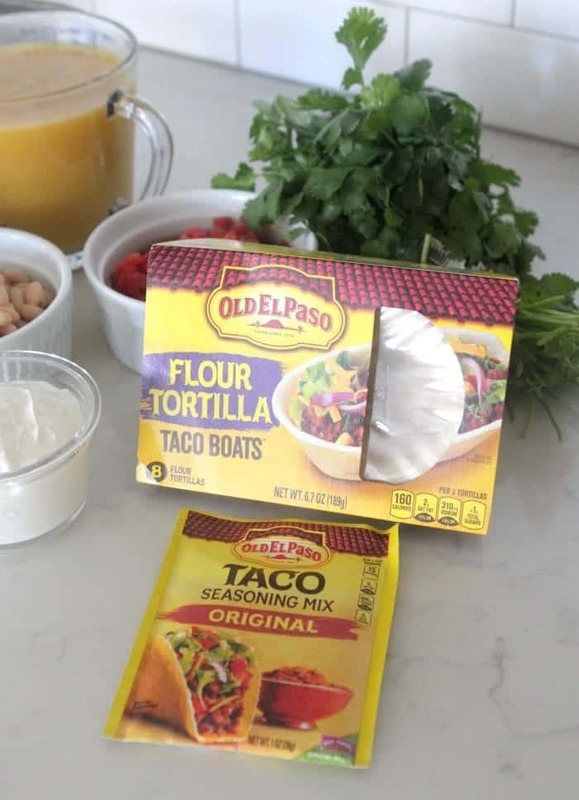 It’s always a pleasure partnering with Old El Paso to bring you new family friendly dinner recipes! We love Mexican style meals and this one is simple to prepare and pleases the whole family! Hope you enjoy! 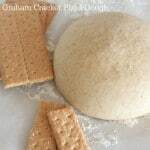 Simple pantry items you are likely to have in your pantry for this recipe! 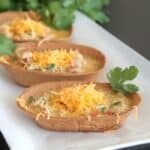 For this recipe I’ve used Old El Paso’s Flour Tortilla Taco Boats and their Original Taco Seasoning. 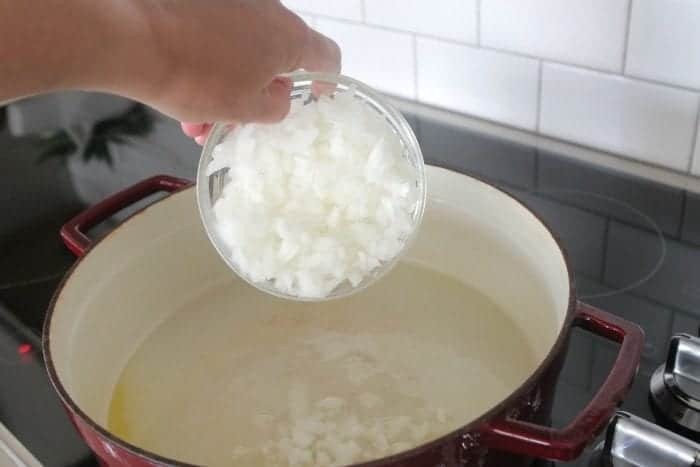 You’ll start by sautéing some white onion then minced garlic in some extra virgin olive oil. Stir in your cooked shredded chicken, broth and then diced tomatoes with peppers. White beans, drained up next. 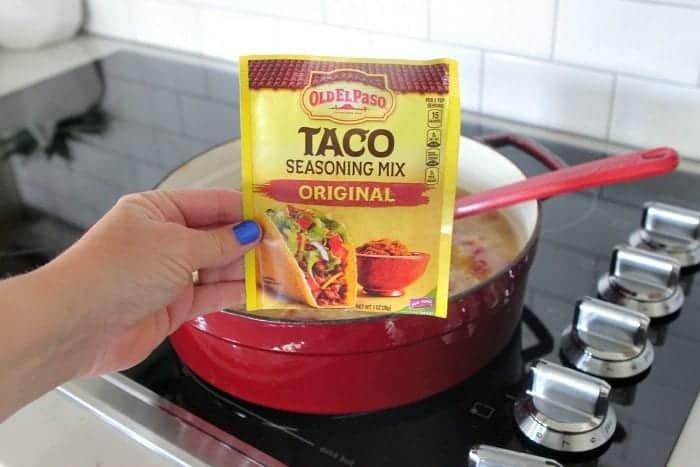 2 tablespoons Old El Paso Taco Seasoning. Up next, add 2 tablespoons of dried cumin as well. Stir in your sour cream. 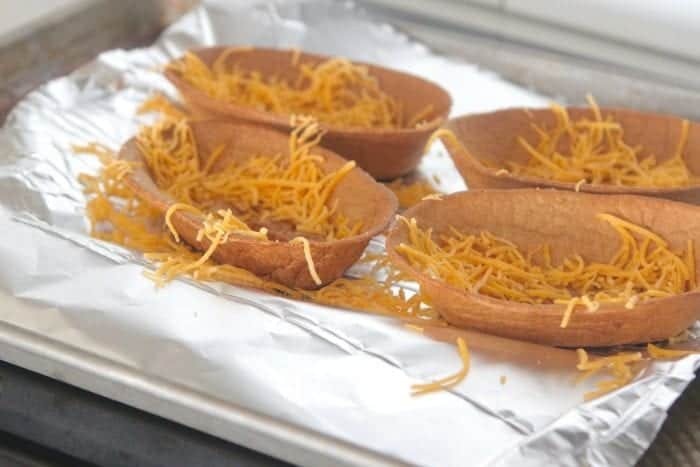 Bake your taco boats until crisp then melt cheese over tops. Spoon soup into taco boats and serve warm. *Try switching up the protein if you’d like. Beef and even ground sausage works great. *Save any leftover soup and serve it over rice for another dinner idea. 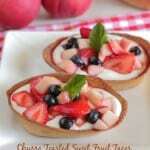 *Serve with a small dollop of sour cream for a creamy version. Preheat oven to 350 degrees F. and heat oil in large skillet or pot over medium heat. Saute chopped onions and minced garlic until softened, about 5 minutes, stirring often. 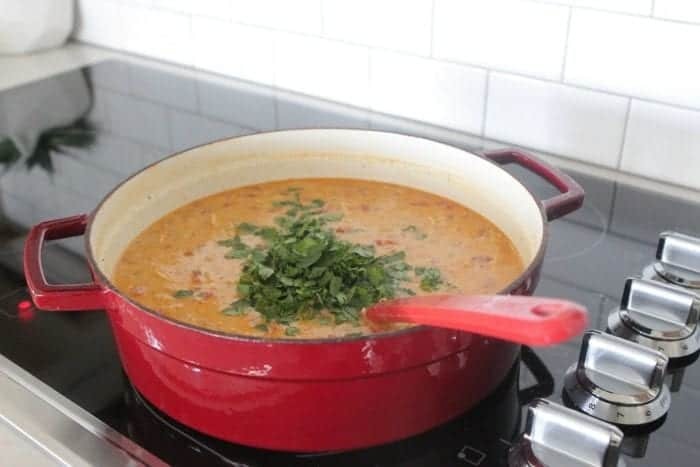 Add chicken, broth, seasonings, sour cream and cilantro to pot. 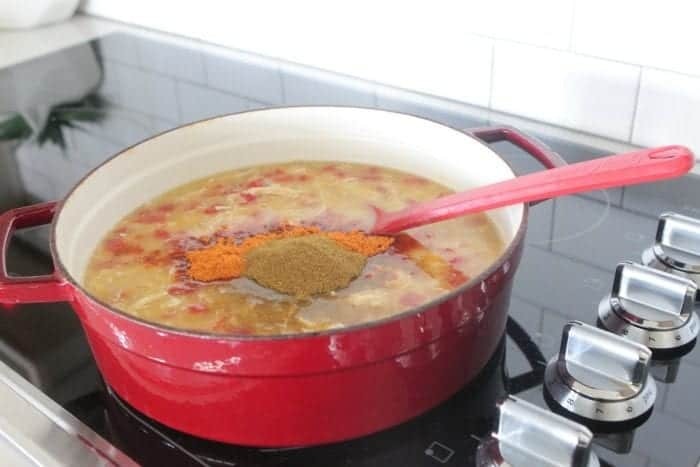 Stir to combine and reduce heat to low to simmer. 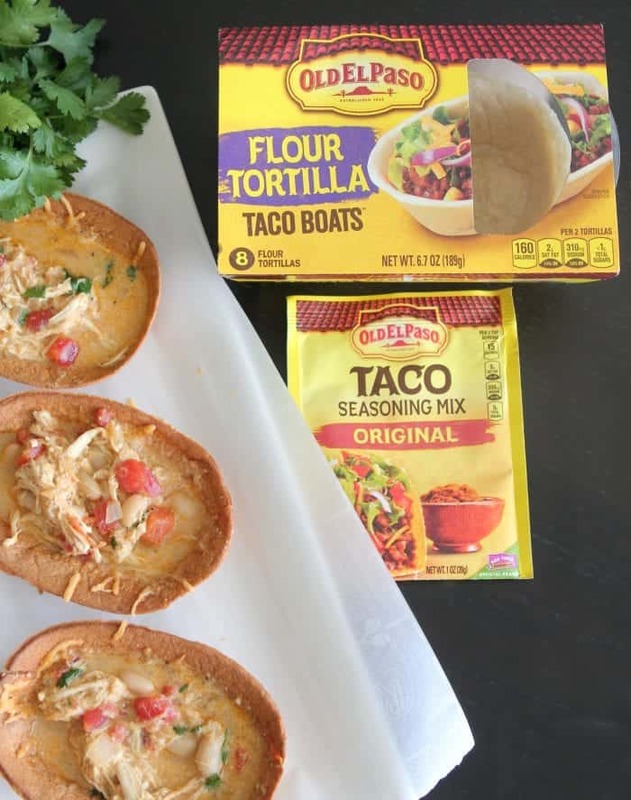 place taco boats onto a cookie sheet and bake for 15 minutes, until crisp. Remove and top with shredded cheese. Return to over for 5 minutes to melt. Spoon soup into crisp taco boats and serve warm. Garnish tops with additional shredded cheese if desired. Do the tortilla boats come that way? I have never ever seen them in 4 stores I went to get some for a different recipe. Or do you form them yourself then bake them. How would you form and keep shaped till baked? Phyllis, the taco boats are an Old El Paso product that come as pictured. They can be hard to find. I can only think of one local store that carries them, and they don’t always carry the same varieties that Jenny uses. I would imagine you can order them online. 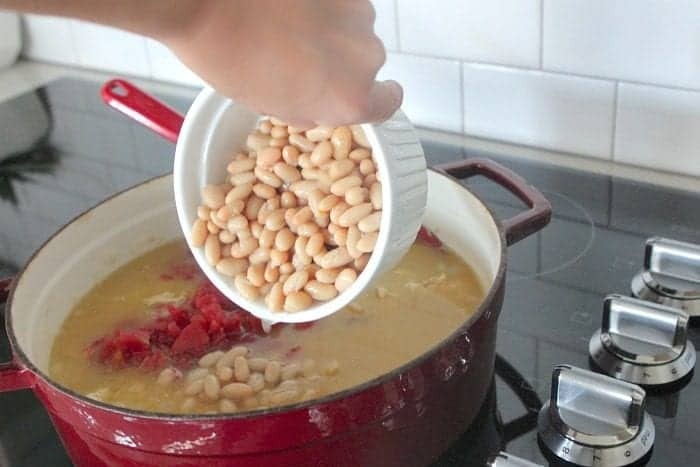 The recipe doesn’t have the white beans, sour cream or tomatoes listed. 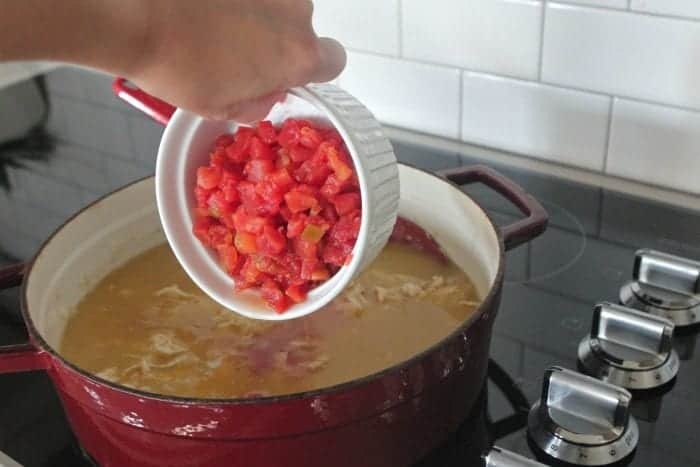 Such an interesting idea to let the kids eat taco soup. I will have to try this. Thank you for sharing. You are so creative! Thank you for sharing the recipe! Such an interesting idea to let the kids eat taco soup. Thank you for sharing. Want to make this tonight. 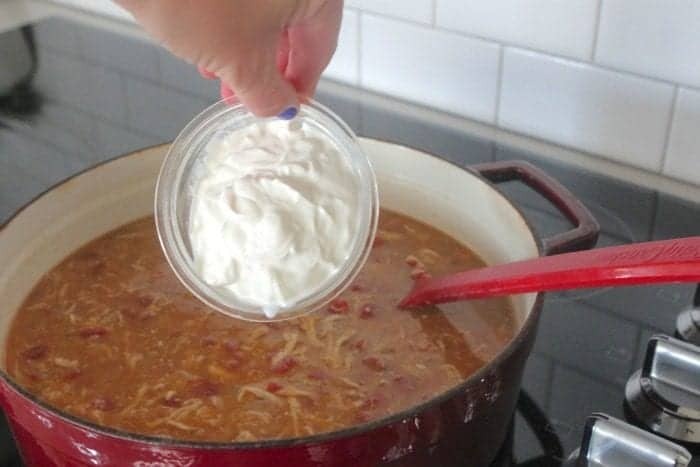 How much sour cream in the recipe? Looks like it was omitted from the list. Thanks!